Series 100 gaskets and gasketing materials are available as an all knitted wire mesh or as a knitted wire mesh over and elastomer core. The knitted wire mesh can be fabricated with .0035” (0.089) or .0045” (.114) diameter Monel or SnCuFe (tin-plated, copper-clad steel) Wire or with .005” (.127) diameter Aluminum Wire. The all metal wire mesh is manufactured by knitting several layers of mesh and forming the mesh into the size and shape. The knitted wire mesh over elastomer core is manufactured by knitting two wire mesh covers over an elastomer core, then forming the mesh to the size and shape of the elastomer core. The elastomer cores are available in Neoprene Sponge, Silicone Sponge, or Solid Silicone Tubing. 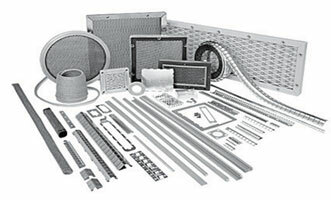 All Seals Mesh provides excellent shielding in applications requiring a very resilient gasket. The all metal mesh is recommended for applications which do not require an environmental seal. The knitted wire mesh over an elastomer core is recommended for applications requiring sealing against moisture, dust or air. All Seals Mesh can be mounted by using sidewall friction in a groove. When using the fin configuration, the gasket can be mounted by spot welding, using rivets or by using a suitable adhesive. All Seals Mesh gaskets and gasketing material are available on continuous length spools or can be cut to length. All Seals Mesh can be manufactured into an unlimited number of sizes and shapes. Contact All Seals for additional shapes, sizes and material composition.